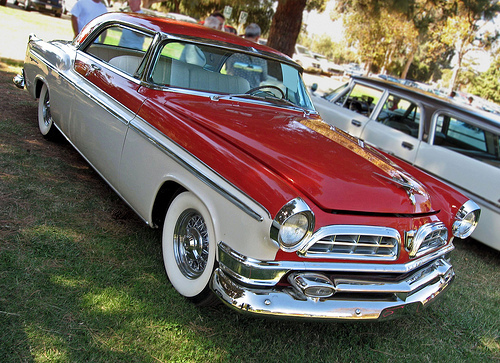 Chrysler’s 1955 models were not so much a new chapter as the first time all the pieces company chairman K.T. Keller and president L.L. “Tex” Colbert had been assembling over the past few years (described in our first installment) finally came together. There was the FirePower V8, now offering 250 gross horsepower (186 kW), along with V8s for DeSoto, Dodge, and Plymouth; there was the fully automatic PowerFlite transmission; there was a full range of power accessories and optional Airtemp air conditioning; and at long last, there was modern styling, courtesy of new styling director Virgil M. Exner, Sr.
Chrysler’s advertising of this period described the 1955 styling as the “Forward Look” or the “100 Million Dollar Look,” although contemporary press reports put the total bill at more like $250 million. The new look was in no way radical — that would come later — but was considerably sleeker than what had gone before, eliminating at a stroke the dumpy proportions of Chrysler’s previous postwar cars. The 1955 Chrysler New Yorker, for example, was 3.4 inches (87 mm) longer and 2.4 inches (60 mm) wider than the ’54, with a 5-inch (127mm) longer hood. The new Imperial, now marketed as a separate make, was naturally the flagship of the Forward Look, with its attractive dual eggcrate grilles providing the cleanest and arguably most attractive front end treatment of the bunch, but even Plymouths were considerably sharper-looking than before and were now a closer match in dimensions and proportions to Chevrolet and Ford. 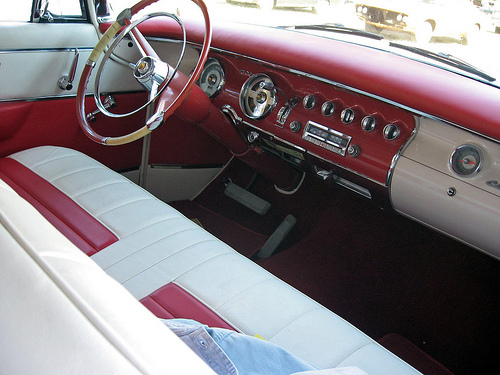 The interiors were new, as well, with pendant-type pedals and an unusual dashboard-mounted shift lever for the PowerFlite transmission, which was now standard on Imperial and all Chryslers except the Windsor and commonly ordered on most of the cheaper makes. The wand-like dashboard lever, suggested by stylist Cliff Voss, was a novelty, but drew criticism as a potential collision-safety hazard and survived only one year. 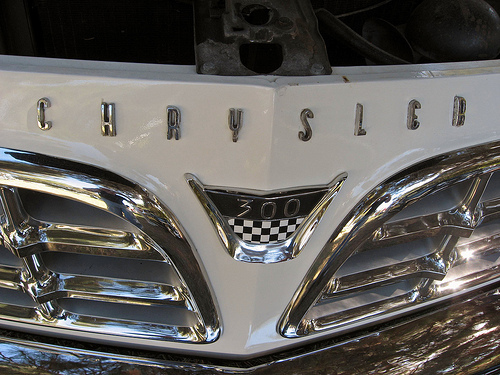 The 1955 model year offered two notable milestones in the engine department: the first-ever eight-cylinder Plymouth — two Dodge-supplied “Hy-Fire” V8s were now optional — and the first-ever Chrysler lineup without a six-cylinder engine. Since the debut of the FirePower, sales of the six had been shrinking steadily and it had been retained in the Windsor line mainly as a price leader. For 1955, the Windsor traded its old flathead six for a new 300 cu. in. (4,905 cc) OHV V8, reviving the departed Spitfire Eight name. The Spitfire was essentially a hybrid of the FirePower block and the cheaper “polyspherical” heads of the Dodge Red Ram engine, with only a single rocker shaft per bank. The smaller V8 made 188 hp (140 kW), up from 119 hp (89 kW) in the 1954 Windsor, which gave junior Chryslers parity with the 1955 Buick Special and Oldsmobile Eighty-Eight. With 250 gross horsepower (186 kW), the senior Chryslers could give many rivals a run for their money in a straight line. Critics like Tom McCahill of Mechanix Illustrated complained that horsepower had increased more than torque — in four years, the engine had picked up 70 horsepower (52 kW), but gross torque output had only climbed from 312 lb-ft (423 N-m) @ 2,000 rpm to 340 lb-ft (461 N-m) @ 2,800 rpm — so you had to wind the engine out to take advantage of its potential. If you did that, though, a 1955 New Yorker was among the fastest cars in America, capable of almost 115 mph (185 km/h). Windsors were not quite that fast, nor were most of Chrysler’s junior makes, but even they had excellent performance for the time. In early 1955, however, all of those cars would be overshadowed by the introduction of Chrysler’s most newsworthy new model: the 300. 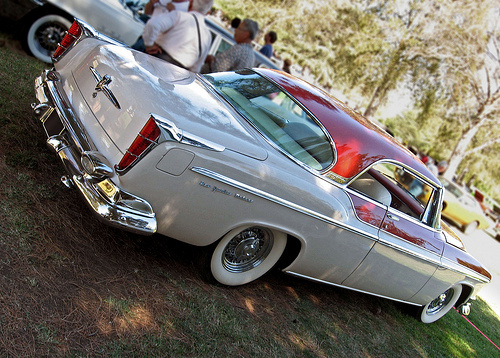 The Chrysler 300 was a very late addition to the 1955 lineup. 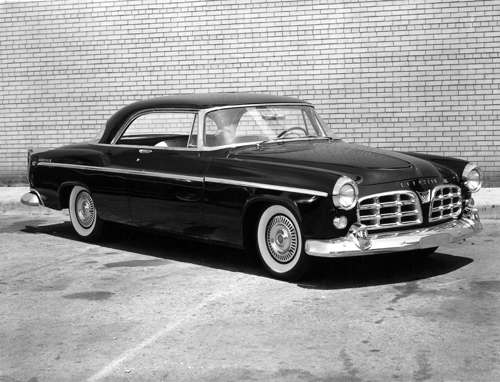 In fact, the 300 was conceived around the time the rest of the 1955 cars were beginning pilot production. The new model was the idea of Robert M. Rodger, previously part of Bill Drinkard’s engine development staff and more recently Chrysler Division’s chief engineer. Rodger had been heavily involved in the development of the FirePower engine and had taken a strong interest in Chrysler’s competition efforts; earlier that year, he had been in Indianapolis for a 24-hour endurance race and he had even gone to Mexico to observe at least one of outboard motor magnate Carl Kiekhaefer’s Carrera Panamericana runs. It was not lost on Rodger or Chrysler general sales manager Bill Braden that most of the FirePower V8’s competition exploits had either been in quite-ordinary sedans and club coupes or in non-Chrysler products like the Cunningham Le Mans cars. Virgil Exner’s Ghia-built concept cars had whetted the public’s appetite for a sportier Chrysler that would be a more worthy showcase for what was, after all, one of America’s most powerful engines. One enticing possibility was a forthcoming concept car from the Advanced studio: the Falcon, a relatively compact DeSoto-powered sporty convertible designed by stylist Maury Baldwin. Virgil Exner pushed hard for Chrysler to produce the Falcon, which would have been a worthy rival to the Corvette or the new Ford Thunderbird. Sadly, the company was not enthusiastic about investing in low-volume specialty cars for the enthusiast market; Chrysler did not have the deep pockets of GM or even Ford. However, as Rodger and Braden undoubtedly recognized, that didn’t rule out the possibility of a high-performance version of the standard Chrysler, sharing its body and much of its hardware with the rest of the line. The decision to market the Imperial as a distinct make may also have factored into their thinking; separating the Imperial from the rest of the Chrysler line left room for a new Chrysler flagship. In August 1954, Chrysler general manager Ed Quinn authorized Rodger to prepare such a model, although Quinn warned that there was no money left for any significant tooling expenditure. Exner and Cliff Voss, by then the chief stylist of the Chrysler and Imperial studios, were naturally excited about the idea and immediately began discussing possible options. The budget wouldn’t permit any significant sheet metal changes or even a new grille, but Exner suggested they instead try mixing and matching existing components. The end result was a New Yorker shell with side trim and rear fenders from the Windsor, the grille and bumpers from the Imperial, and the chromed wire wheels optional on other Chrysler products. Rather than adding more brightwork, as was customary for fancier models, Exner suggested they keep the use of chrome to a minimum, which was not only cheaper, but also made the performance model the cleanest-looking of the 1955 Chrysler line. The limited trim also discouraged two-tone paint, something of which Exner wasn’t especially fond. (Although the sales department had insisted on offering two-tone combinations in the New Yorker and later the Windsor lines, Imperials were generally limited to more dignified monochromatic color schemes, possibly at Exner’s insistence.) One new touch were the checkered-flag badges, inspired by the emblems worn by Briggs Cunningham’s sport-racers (discussed in Part 1).